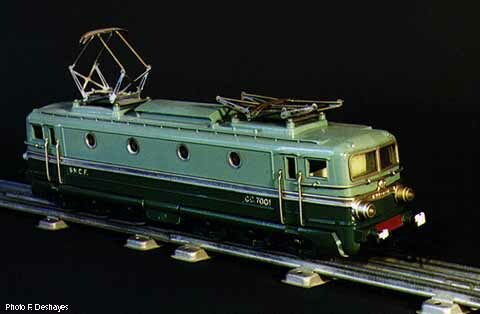 Cette locomotive fut construite par la firme française JEP de 1951 à la fermeture de l'usine en 1965. D'une longueur de 35 cm et d'un poids de 3 kg cette locomotive est très puissante car propulsée par 2 moteurs du type AP5 entrainant chacun 6 roues motrices. Cote moyenne de ce modèle 3000 à 4000 F This locomotive was built by the French JEP firm from 1951 to the closing down of the factory in 1965. 35 cm long and weighing 3 kg this locomotive is powered by 2 electric motors of the AP5 type with 6 drive wheels each. Average quotation of this model : 3000 to 4000 French Francs.